Hi, welcome back! 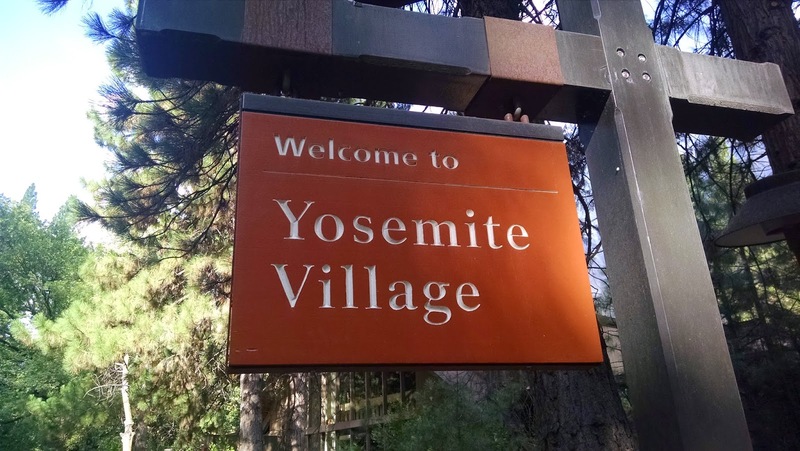 Thanks for checking in to read Part III of our California Vacation Adventure 🙂 This blog post will focus on our first day at Yosemite National Park. 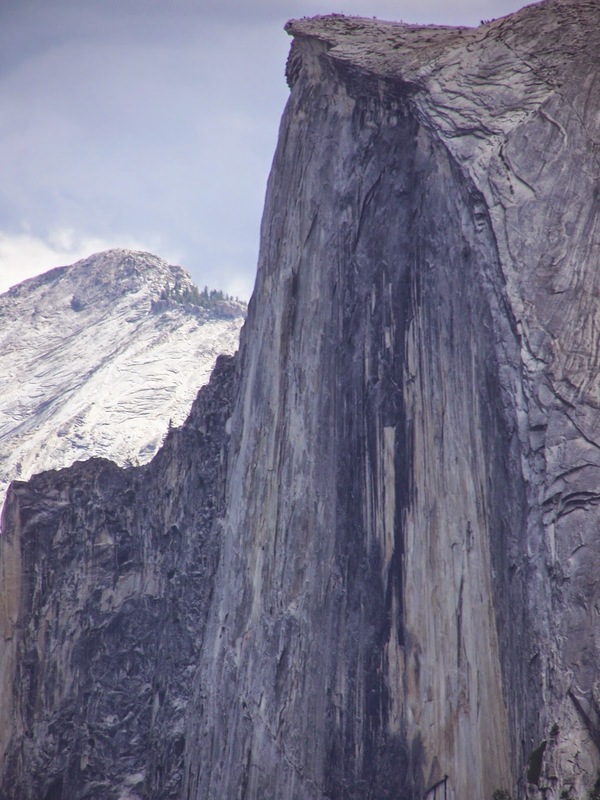 The photo above shows a far away view of Half Dome. It was taken in the morning on our drive up the mountain. The fog that you can see in the photo might actually be partially smoke. We could definitely smell it when we pulled over and got out of the car. The drive to Yosemite Valley was breathtaking. For someone like me who has never spent time away from the East Coast, it was incredible to be surrounded by such huge mountains. Everywhere you look you were surrounded by nature’s beauty. Even now as I look back at some of my photos I feel like this trip couldn’t have been real. I’m awestruck that we were there, hiking those trails, enjoying the peace and serenity that you can only get through nature. 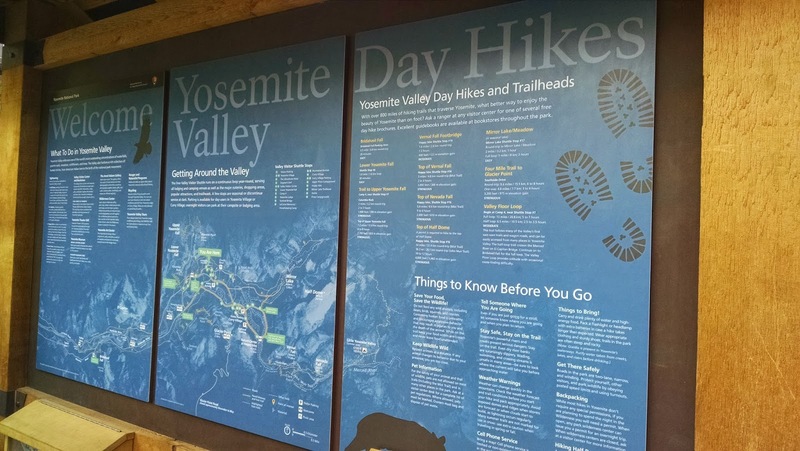 We decided to continue to the Yosemite Valley Visitor Center to look into a different hike. 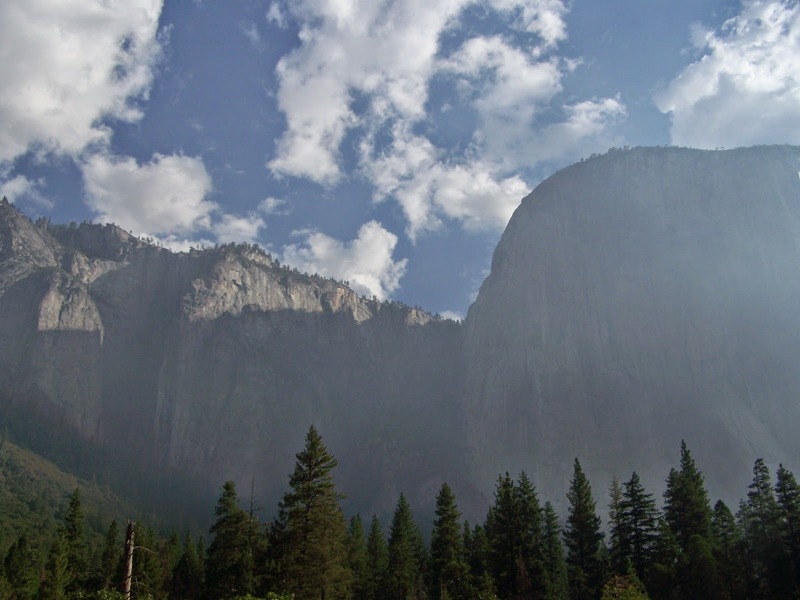 While we were there we talked with a park ranger about our Half Dome hike the following day. We wanted to make sure we didn’t need to print our Half Dome permits to show the ranger at the base of the subdome. 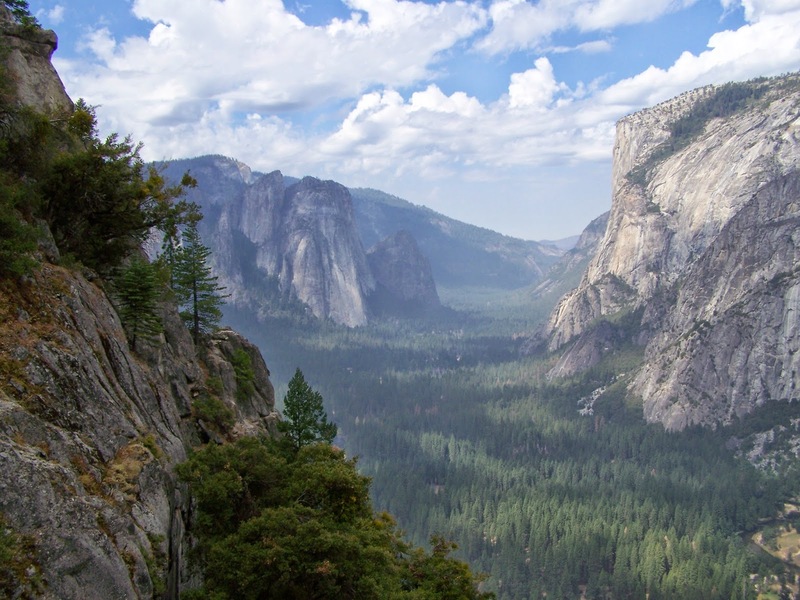 After looking at the Yosemite Valley Day Hikes map, we decided to hike to Glacier Point via the Four Mile Trail. 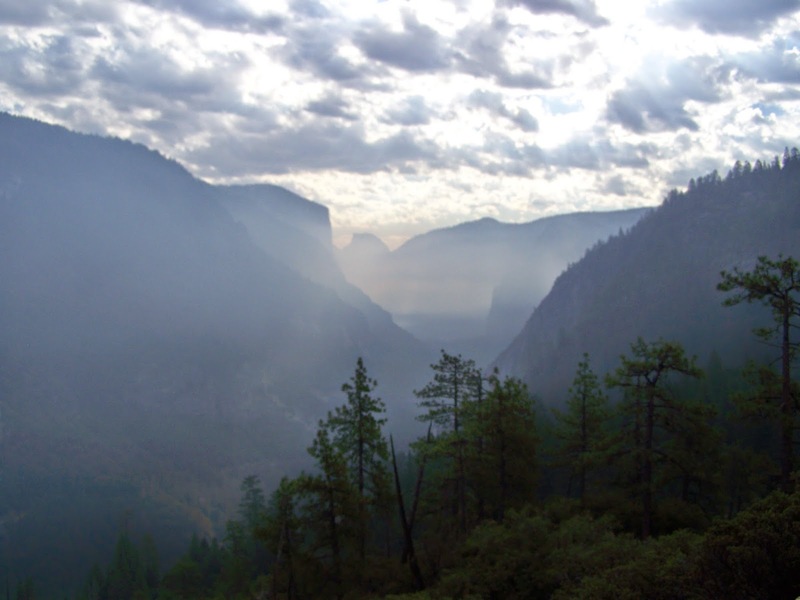 The reason for choosing this trail instead of the hike to Vernal and Nevada Falls is because if we hike the Mist Trail to Half Dome, we would get to see the falls then. 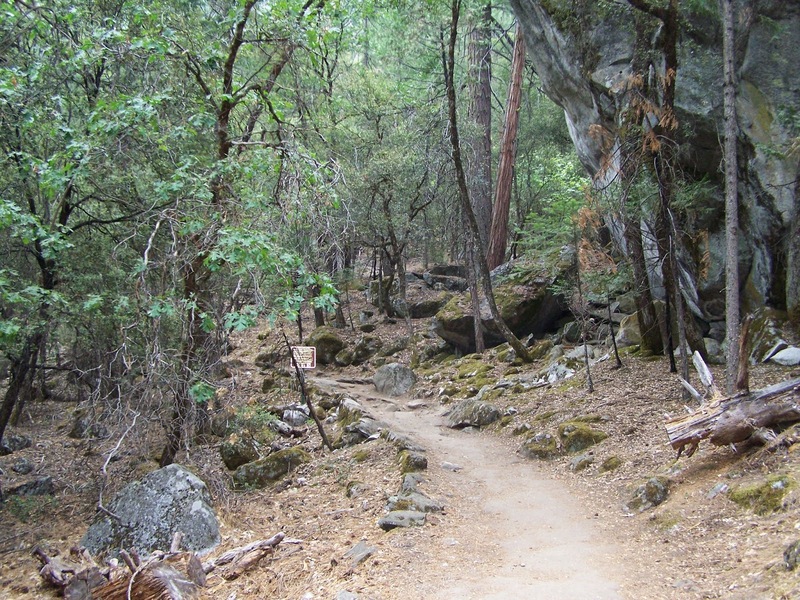 The Four Mile Trail is actually 4.8 mi one way or 9.6 mi round trip. Over the 4.8 mi hike you climb 3,200 ft. The National Park Service (NPS) claims this hike can take 3-4 hours one way– we did it in under two hours. During this hike I came to the realization that there are some definite benefits to being a slow runner. As I just mentioned, the NPS suggests that this hike can take 3-4 hours one way and we summited in under two hours. Nick is good at everything, but for me, this was slightly surprising. Especially since we were at altitude. I attributed the speedy-ness of our hike to the fact that being a slow runner means that I’m used to working at my maximum capacity for long periods of time. During marathon training, I would be out running for 4+ hours during long runs– almost the entire time working at a Rated Perceived Exertion (RPE) Scale of a 6 or 7 (heavy to very heavy). Hiking up the tough, steep Four Mile Trail compared pretty directly for me on the RPE Scale. I’m also used to having to take in fuel during long periods of exercise, so my body is used to eating even when the thought of eating isn’t appealing. It was definitely a confidence booster to be able to conquer this trail fairly easily. The only times we stopped were to take photos. 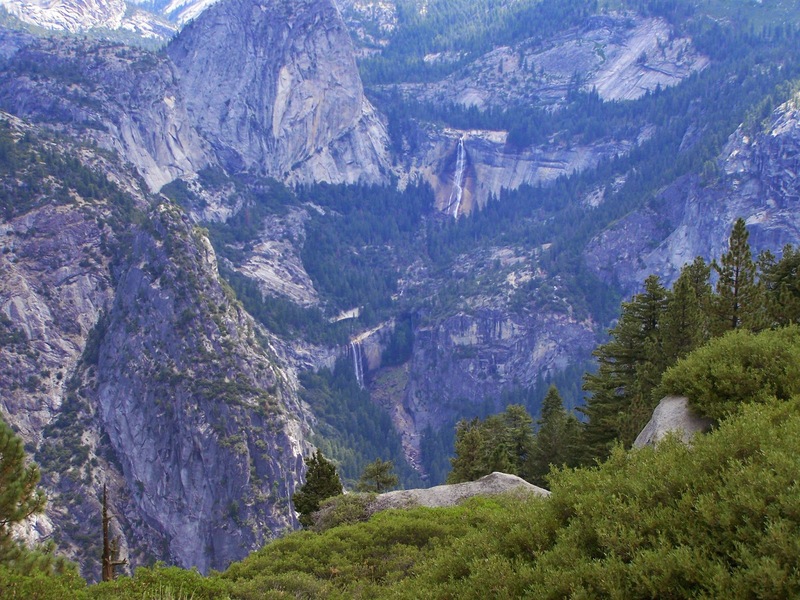 You can see, both, Vernal Falls (lower) and Nevada Falls (upper) in this photo. 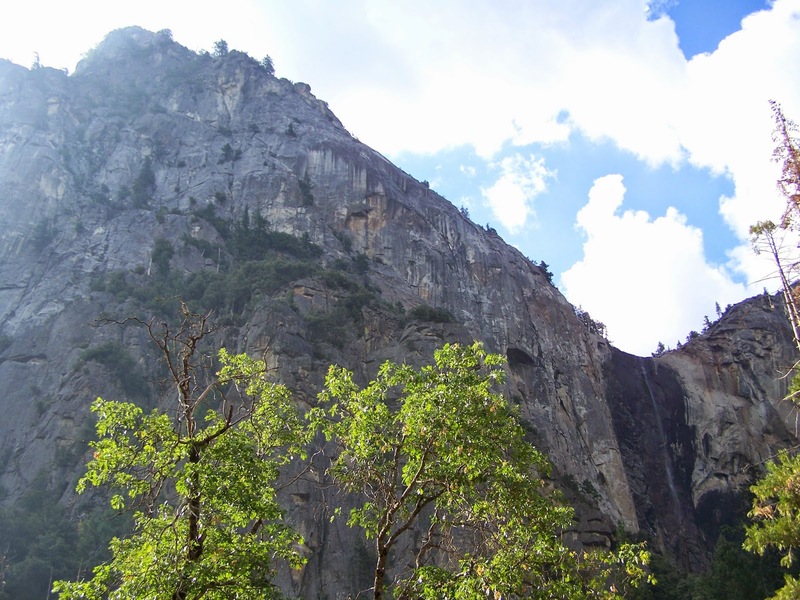 You pass both of them via the Mist Trail and John Muir Trail on the hike to Half Dome. If you look really close you can see people on the Half Dome summit. When we reached the Glacier Point summit we were really disappointed to see there were hundreds of people walking around. We hardly saw anyone on the trail– maybe 10-15 people. 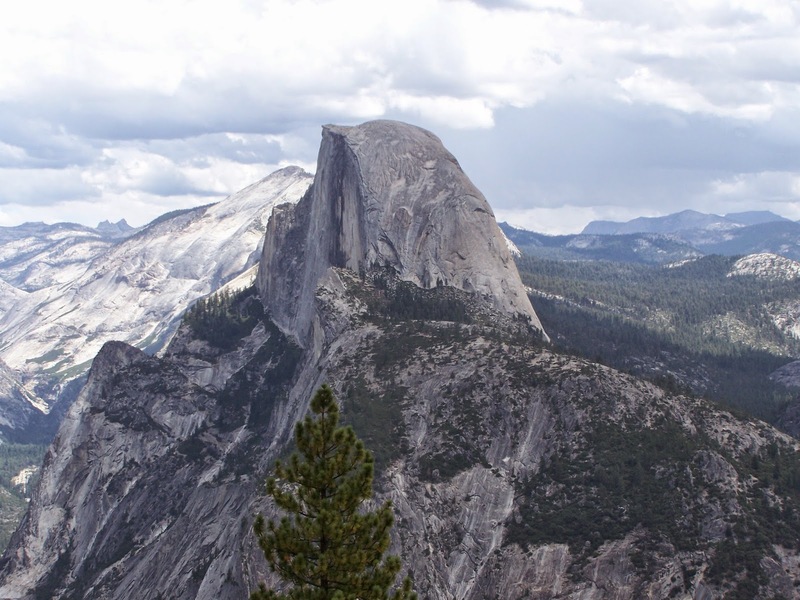 We were fully expecting to be able to enjoy a quiet lunch overlooking Half Dome and the Yosemite Valley. Turns out that you can drive to Glacier Point. There were restrooms, a gift shop, and a restaurant. We didn’t realize any of this because it was a last minute decision to hike to Glacier Point. I was frustrated with the women walking around in flip flops carrying their designer hand bags. I thought they should at least look the part. Nick felt opposite– he’d rather they wear their flip flops than walk from their car carrying gear that looks like they were doing a week-long wilderness hike. Here’s a video of the crowd at the Glacier Point summit. Even with the crowd, Glacier Point was really neat. And we definitely felt a little haughty having actually climbed to the top. 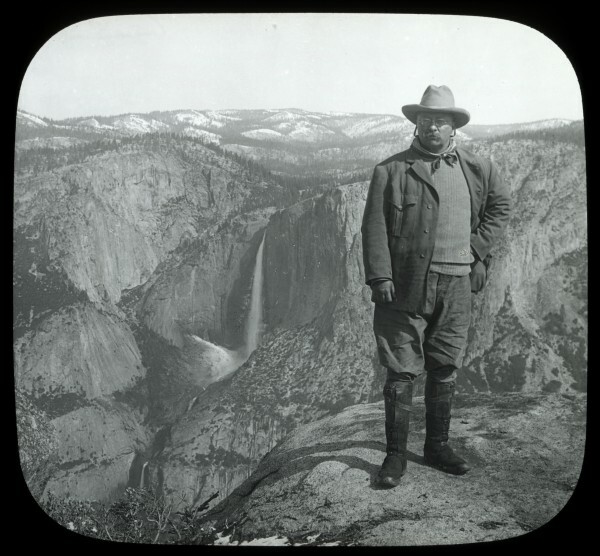 This is a famous photo taken of President Theodore Roosevelt overlooking the Yosemite Valley from Glacier Point. This photograph was taken in 1903. 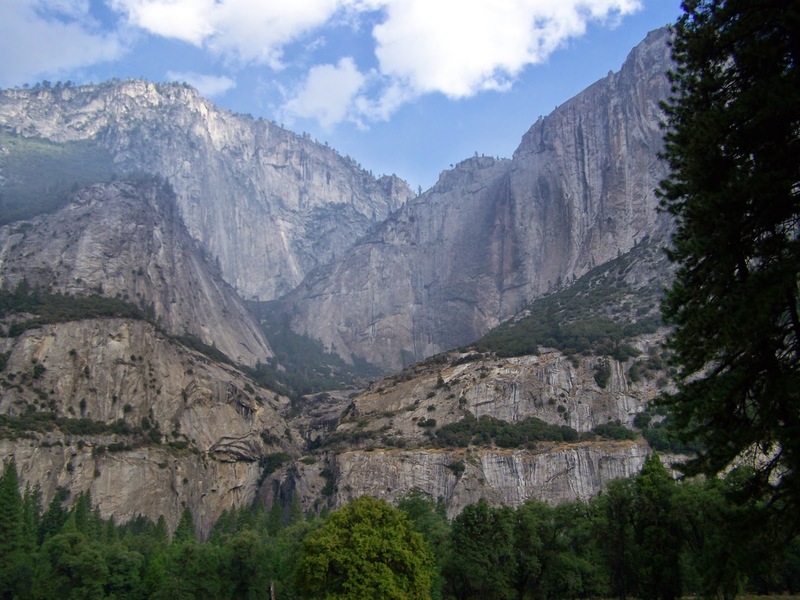 Roosevelt camped with John Muir, a naturalist and preservationist, and during this time Muir convinced Roosevelt to make Yosemite Valley part of the National Park Service. And this is how we got Yosemite National Park 🙂 Pretty cool. We finished out our first day at Yosemite National Park by relaxing at Sentinel Beach, a small lake on the way out of the park. Yosemite National Park was one of the coolest places I’ve ever been. If you’re considering going– don’t hesitate. You will love it. 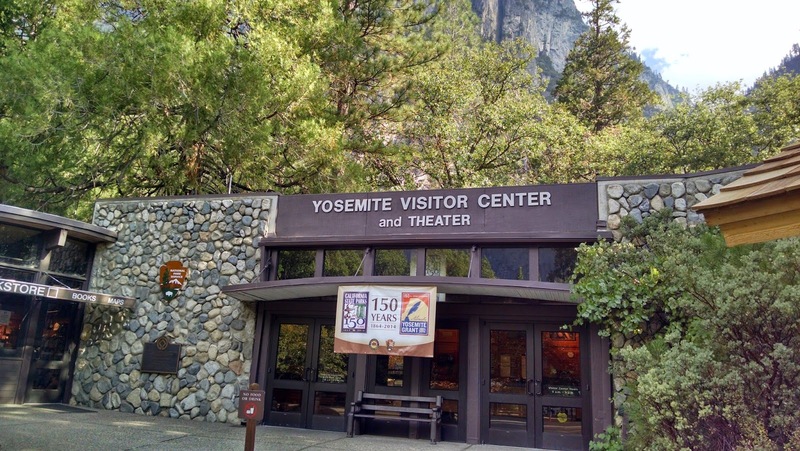 If you enjoyed reading about our first day at Yosemite National Park, please check back later to read about the rest of our California Vacation Adventure. 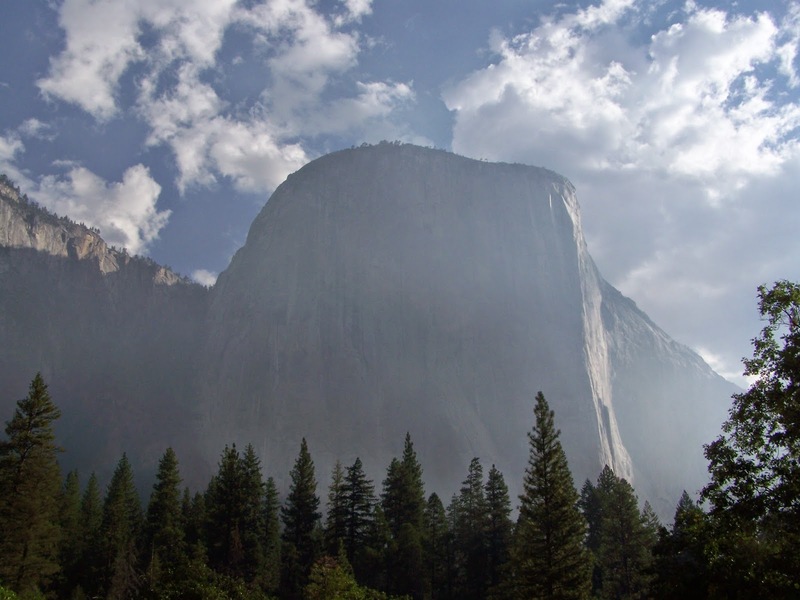 Up next: Hike to Half Dome!